Subject: Fw: Who died before they collected Social Security? Very very interesting!!!! Maybe this is what we need to send to all the elected officials in our government!!!! Want to see your representative do the "Washington-two-step”? EVERY ONE HAS HAD THE OPPORTUNITY TO READ IT..
TO FIGURE IN THE PEOPLE WHO DIED BEFORE THEY EVER COLLECTED A SOCIAL SECURITY CHECK!!! WHERE DID THAT MONEY GO? If you averaged only $30K over your working life, that's close to $220,500. Did you see where the Government paid in one single penny? We are talking about the money you and your employer put in a Government bank to insure you and me that we would have a retirement check from the money we put in, not the Government. Now they are calling the money we put in an entitlement when we reach the age to take it back. If you calculate the future invested value of $4,500 per year (yours & your employer's contribution) at a simple 5% interest (less than what the Government pays on the money that it borrows). After 49 years of working you'd have $892,919.98. If you took out only 3% per year, you'd receive $26,78760 per year and it would last better than 30 years (until you're 95 if you retire at age 65) and that's with no interest paid on that final amount on deposit! If you bought an annuity and it paid 4% per year, you'd have a lifetime income of $2,976.40 per month. THAN BERNIE MADOFF EVER DID. Entitlement my foot; I paid cash for my social security insurance! Just because they borrowed the money for other government spending, doesn't make my benefits some kind of charity or handout!! Now that's welfare, and they have the nerve to call my social security retirement payments entitlements? 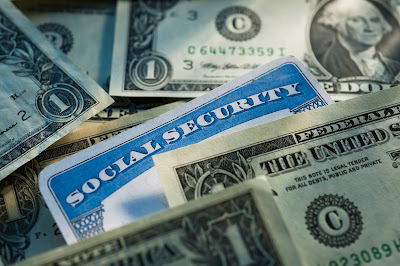 They call Social Security and Medicare an entitlement even though most of us have been paying for it all our working lives, and now, when it's time for us to collect, the government is running out of money.